So this week is more about treating my body with respect by cooking healthy food, and yet I never want to sacrifice taste. You shouldn't either, and you don't have to. It is possible to enjoy a healthy dish like Red Curry Dumplings every bit as much as those crispy fried chicken tacos. I promise you're going to enjoy this dish. I made the dumplings and soup broth on Sunday and today I'll be enjoying my third helping for lunch. But before I share this simple recipe with you, I'd like to introduce you to the newest addition to my kitchen repertoire - this lovely JIA Steamer Set that I procured from Heidi Swanson's delightful QUITOKEETO online shop. The store isn't open all the time - and the beautiful yet resourceful items you'll find there will sell out fast, so be sure to join their waiting list to receive updates. I missed out on this beautiful steamer the first time around - I was on the road, traveling, and when I got caught up with my emails, this beautiful ceramic pot (which doubles as regular casserole) and bamboo/terracotta steamer basket was already sold out. It was easy enough to sign up for future availability and seeing it now, resting quietly on my kitchen shelf, makes my heart happy. The red curry dumpling recipe I've included below is a spin on Heidi Swanson's green curry dumplings - I simply swapped out the green curry paste (which is a bit milder and sweeter than red curry paste) for the red, because I had it in the refrigerator. This is a vegetarian dumpling but I promise it is just as savory and flavorful as any pork+chive dumpling I've enjoyed. Leeks and mung bean sprouts are sauteed gently in rich coconut cream until the mixture becomes soft and sweet. Thai red curry paste (which consists of garlic, shallots, ginger and shrimp paste) provides heat from fresh red chiles which is complimented by the sweetness of the coconut milk and cream. The little bundle, full of healthy veggies, is rather indulgent. Treating yourself right never felt so good. These dumplings can be steamed (which is the first way I enjoyed them), cooked in a broth, and even pan-fried if you want them crispy. I took advantage of my new steamer set and simmered a simple chicken broth in the casserole while the dumplings steamed gently above the broth in the bamboo/terracotta steamer. These are so beautiful, and so delicious, and I hope you enjoy them as much as I do. In a large skillet over medium heat, add a dollop (around 1+ tablespoons) of the heavy cream from the top of your coconut milk. You can substitute the coconut cream for coconut oil if you'd like, but try to use that coconut cream if you can. Add the leeks and cook, stirring often, for 10-15 minutes until they are cooked way down, seasoning them with the salt. If your pan dries out, stir in a bit more of the coconut milk or a tablespoon of water. When the leeks are cooked through and caramelized, add the curry paste and cook for 2-3 minutes. If your paste is very thick, you can thin it a bit with water or a tablespoon of the coconut milk. Add the cooked mung bean sprouts to the skillet. Add enough coconut milk to the mixture to keep it moist (4-5 tablespoons). Add a squeeze of lemon or lime juice. Taste the mixture and adjust the seasoning if necessary. Allow the mixture to cool to room temperature. To make the dumplings, place a rounded teaspoon of the leek mixture in the center of the dumpling. Use your finger or a pastry brush to wet one side of the half of the dumpling, and fold the dumpling in half to create a half-moon shape. Try not to use too much water to seal the dumpling, which is why I recommend only wetting one half side - too much water and your dumpling will get "gummy" and stick to everything it comes in contact with. At this point, you can cook your dumplings if you'd like by steaming them for 7-10 minutes in a steamer, or boiling them gently in broth or water, or by crisping them up in a pan like you would a gyoza. If you're steaming your dumplings in a bamboo steamer or terracotta steamer like mine, I recommend you place a round of parchment paper (pricked with a toothpick) on the surface before adding the dumplings, as the dumplings are prone to stick to the surface of the steamer. Here is the simple chicken broth I made so my little dumplings had something to swim in. Add all the ingredients above (except the green onions) to a saucepan, or in my case, the bottom of a steamer pot. Gently bring to a boil, then turn down so the soup gently simmers. 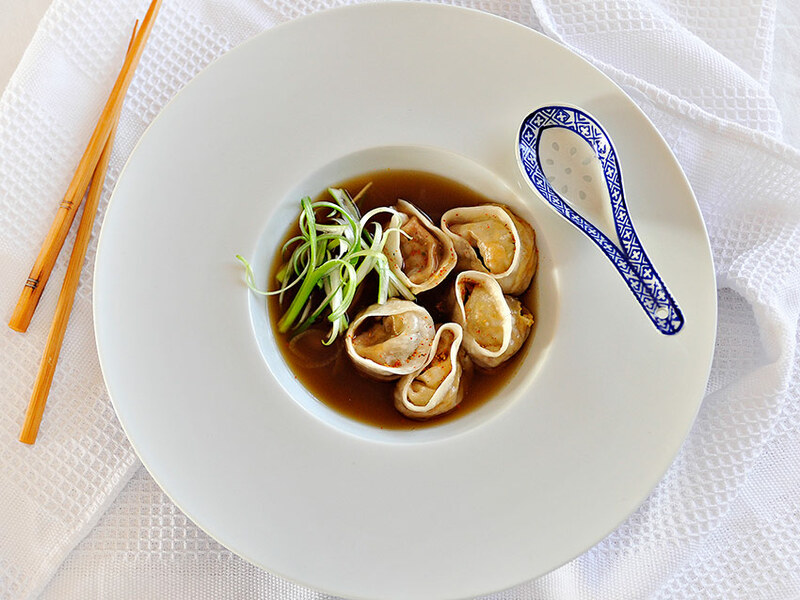 Place your steamer basket with dumplings on top of your steamer and cover with a lid. Cook gently for 7-10 minutes.